These highly lacquered tables have bases made from cherry, with a soldier course of pear veneer on the edges and a 4-way bookatch of madrone burl veneer on the table tops. 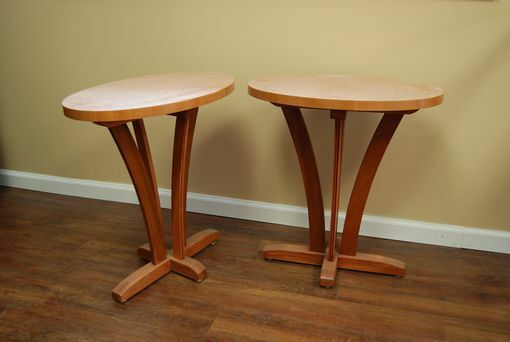 The tables stand 23" tall, and the oval tops are 24" by 14" and are an inch thick. The open and airy design gives you much needed horizontal surfaces next to couches ans chairs, but doesn't take up a lot of visual space to help lighten the feel in the room. The bases sport adjustable feet, letting you level on uneven floors or to sit politely on carpeting.